Some records have an instant impact and some take some thought and digestion … ‘All The Suns Of The Earth’ falls firmly into the latter category. On first listening (albeit whilst doing some interminably dull paperwork) I just didn’t ‘get it’ and thought it all a bit of a mish-mash. However, with a second, focused, listen it became clear that this LP is something special. E Gone is Daniel Westerlund, formerly of Swedish psychedelic folkies The Goner and what he has created here is a piece of work that bewilders, confuses, beguiles and seriously impresses, and defies any easy categorisation. First track ‘Hexx’ has psych/garage staples of twangy surf guitar and Farfisa, but also sitar and banjo and some lovely electronic noodling. ‘The Drug Behind The Drug’ shifts the gears down a notch with a rich, drone-laden soundscape. ‘The Poor Of Heart’ has a windblown Americana feel to it while ‘Blind Tribe’ takes us back to the same country as ‘Hexx’ – a harder psych track laden with effects and groove. 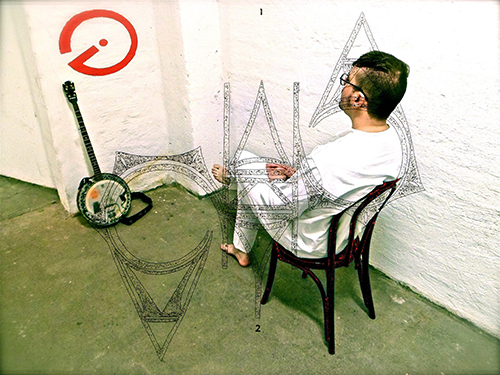 ‘Hanumannerism’ conjures up a 21st century middle eastern souk with it’s tablas and drones. In ‘Traveler, You Will Sing’ Westerlund once again revisits his psych-folk roots. ‘Hazel Motes At The Plastic Vortex,’ for me, is the stand out track – it evolves from folk done Tangerine Dream style to an effects laden, spacey synth workout. ‘You Will Sing’ adds some gentle post-rock to the mix before ‘Fever Child’ brings the LP to an end with simple folksy ballad. I’m so glad I gave this another listen (there have been more since). What Westerlund has given us is an immensely satisfying LP that wears its influences and musical loves proudly on its sleeve. It is ambitious and grand whilst avoiding sounding pretentious and over-reaching. If you order the vinyl from those lovely people at Sunrise Ocean Bender, you get a beautiful object; embossed gate-fold sleeve and white vinyl – looks yummy. For us in the UK it is available from the mighty Cardinal Fuzz.